When you’re renovating your home’s flooring, it’s important to get a product that meets your particular needs. At our flooring showroom, we can help. With our wide selection of waterproof flooring in Lubbock, TX, we’re confident you can find a new floor in a style that matches your décor and is built to last. If your flooring needs involve water-repelling, stain-resisting qualities, you’ve come to the right place. From waterproof luxury vinyl flooring to waterproof carpet, there are plenty of materials and styles to choose from. Our sales staff is ready to help by talking to you about the different brands of waterproof floors we offer, including Tigressa H2O and Downs H2O. With this information, you’ll be able to make a completely confident purchase decision. Flooring options should be expansive, no matter what room you’re renovating. With our help, you can find the perfect floors for your bathroom, kitchen, laundry room, or basement. 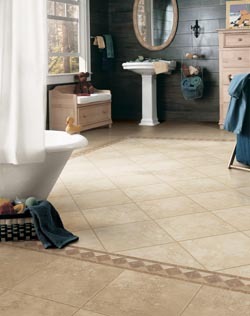 For moisture-prone rooms like these, we suggest our waterproof luxury vinyl flooring. Vinyl today is a long cry from the vinyl of decades past. It’s made to be stronger and more beautiful. In fact, you can get floors that look just like wood or tile but are much better at repelling water. This makes cleaning up a spill a breeze and greatly reduces the risk of stains. This means your floors will stay looking as good as new for years to come. One thing that stops many homeowners from installing carpet in their living rooms, nursery’s, or bedrooms is the fact that they have pets or small children, or they’re simply prone to spilling things themselves. Cleanup with carpets is thought to be a hassle. Fortunately, Tigressa H2O makes it much easier. This waterproof carpeting offers all the benefits you’d find with traditional carpets, including comfort, insulation, and increased safety, but it goes beyond traditional carpeting to repel liquid and stains. So if you love the look and feel of plush, luxurious carpet but never thought you could maintain its cleanliness, talk to us about this waterproof flooring option. When you shop at our flooring showroom, we want to give you peace of mind about your purchase decision. That’s why we offer some of the best warranties and guarantees in the industry. Our Confidence Plus Warranty, for example, gives you 30 days to try out your 4- or 5-Star waterproof flooring in your home. If you don’t like it, let us know within that time, and we’ll replace it without charging for labor. We also offer Price Protection and Lifetime Installation Guarantees that work to ensure your complete satisfaction. Contact us today to learn more about our waterproof flooring options. We proudly serve customers throughout Lubbock, Plainview, Seagraves, Littlefield and Tahoka, Texas.